There is a new entry to the timer market, Derby Timer. No, this is not Bert Drake's DIY timer that used to reside at that same URL. This is a commercial timer company that makes 1 to 4 lane dual sided timers. 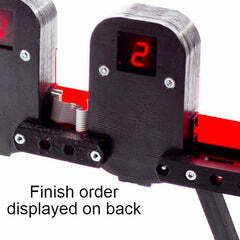 On the front, the timer displays the finish position, finish time and even the lane number for each lane. On the back side, they display the finish position for each lane. They are rather a nice looking timer, but what is really surprising is the cost. Dual sided timers that display finish order and times can get quite pricey, but these ones are so much less. 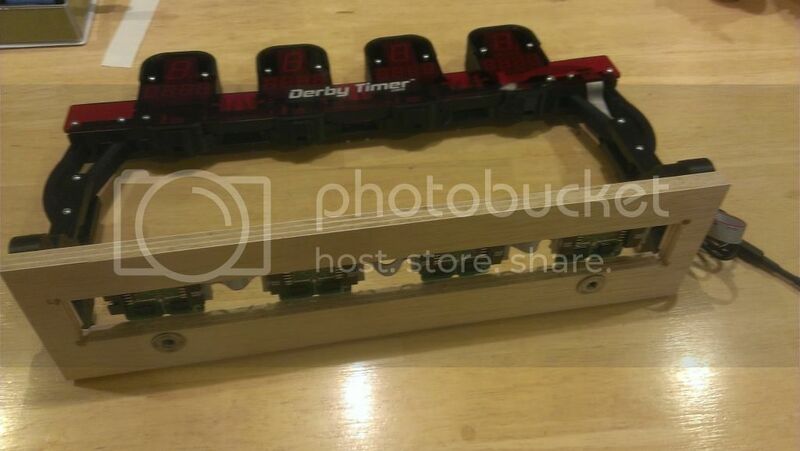 Below are some photos of the timer from the Derby Timer website. First, some comments on the timer. The parts of the timer are actually 3D printed plastic, not molded. Not as smooth as molded plastic, but I don't see that as a drawback. The red plexiglas covering the electronics is nicely laser cut. 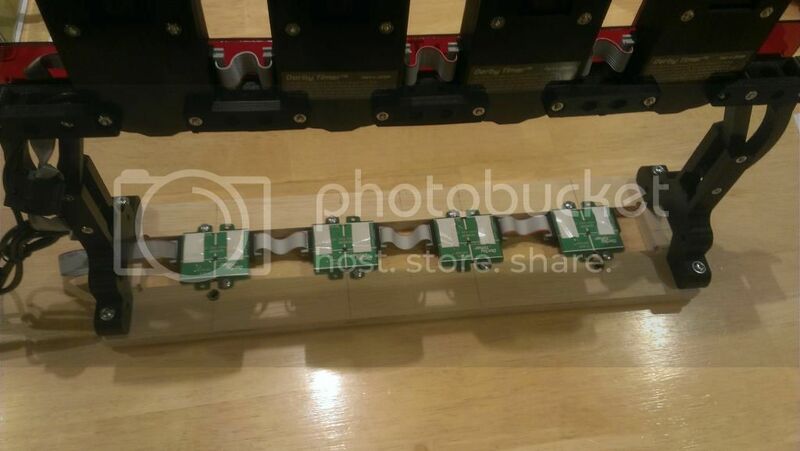 The legs can be adjusted to tracks of different widths and have several mounting holes in them to give you flexibility in mounting to various tracks. Lane spacing is the typical 3.5", but they can do custom lane spacing upon request. The timer comes with two cables, a 15 ft USB cable and a 50 ft start switch cable. The USB cable provides power to the timer and handles communication between the timer and computer. For start sensing, they include a magnetic switch. Each lane has a sensor module that goes under the track. There are a few different ways that you can secure those sensor modules to the track (more on that later). While the timer may display times out to 0.001 seconds, when used with a computer, resolution is out to 0.0001 seconds. Though, the actual timing precision is out to 0.0005 seconds with the unit that I tested. They offer an optional 32 ft USB cable extension for those, like me, that like to setup their computer close to the start line. Normally, USB cable length is restricted to 5 m (16' 5"), but these cables actually boost the signal so you can put the computer close to your start gate. With the 15 ft included USB cable, that gives you 47 ft of reach from the finish line. For those that don't want to use the timer along with a computer, they offer a USB power adapter that plugs into the wall. While the timer comes with a start switch, it can actually run without one, if needed. 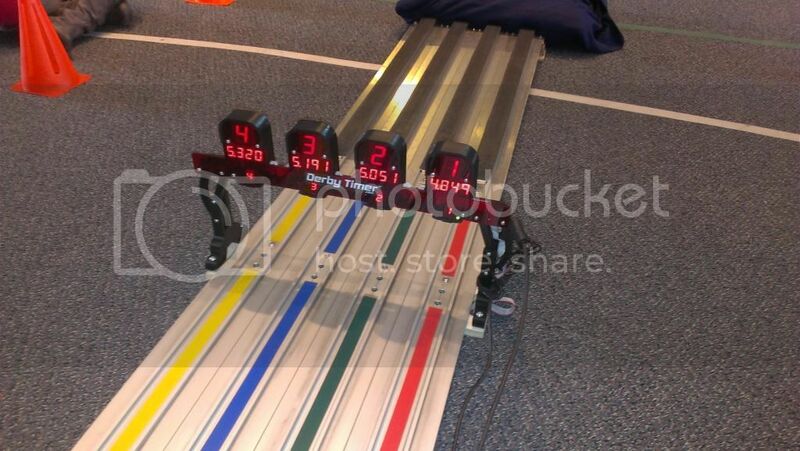 The timer will show the finish order and the time differential of each car compared to the first place car. That can be handy for those with 2 to 4 lane tracks that don't care to score by finish times or might be running into a problem with their start switch or cabling. On their single lane timers they have a nice feature of displaying the difference between the current finish time and the last run, so you can quickly see if you had a faster or slower run than last time and by how much. Being a USB timer, the Derby Timer does require the installation of drivers to get it to communicate with a PC. Many people have run into headaches installing drivers for USB timers or USB to Serial Adapters. While not plug-n-play, for me the driver installation was relatively painless. The timer did not come with the drivers, so I did have to download them from the Derby Timer website. Following the instructions on their website, the drivers installed with no problem on a Windows Vista and a 7 computer. For the sensor modules and start switch, while you can mount them to your track, I really prefer to store the timer completely separate from the track. You can then test the timer with race management software without having to also dig your track out of storage. At a minimum, you could use velcro strips to secure those parts and remove them from the track once the race is over. However, I chose to make a bracket to mount the sensors and timer unit to (photos below). It has the additional advantage of keeping the sensors in line with the IR emitters above the track. I made it out of some scrap 3/4" plywood, with a cut-out for the sensor modules. I had a couple of T-nuts handy, which I added to the bracket to firmly secure the bracket to the track. I then screwed the timer legs on top of that bracket. What I was shooting for was the maximum height between the track surface and the lane modules, as for our race rules, we allow cars up to 5" in height. I was able to get very close to that clearance by reducing the distance between the legs. If I bring the legs in a bit tighter to the track than I did, I can probably get that full 5" clearance. With the timer and sensor modules secured to the bracket, it is easy to slip the whole thing over the end of our finish section and then secure it in place. I can easily see this same type of bracket working on a Best Track and many wooden tracks. I have recommended that the manufacturer offer some type of track mounting bracket as an add-on, as I really think that it is a convenient mounting solution. Testing sitting at a desk is one thing, which I did quite a bit of, but the true test of a timer is during actual race conditions. Each season, I help from 12 to 15 local Awana Clubs run their races and was able to "battle test" their 4 lane timer model at a recent race. I had no problems with the timer at all. Mounting the timer to the track with my home made bracket was a breeze. The photo below shows it mounted to our track ministry's Micro Wizard track. I did mount the start switch to the underside of the start section with velcro, though, I only used that switch for some pre-race testing. For the race I used the mechanical start switch that I normally use. While there probably would not be a problem with the magnetic switch, I had an issue with one during a race several years back and that has sort of jaded me to those type of switches. So, I went with what has been tried and true for me. The manufacturer helped by making a pigtail that connected their start switch cable to the phone jack for my mechanical switch. The serial communications worked just fine using the 32 ft extension cable along with the supplied 15 ft USB cable. It was actually nice not to deal with running an extension cord to power the timer, since the timer gets its power from the USB cable. Those sitting at the end of the track seemed to appreciate the finish order display on the back of the timer. Overall, it is a very nice timer and you get a lot for your money. While that pricing is nice, it would still be great if they had an option of saving a bit by having the customer do some of the timer assembly. It would also be quite nice if they offered some type of track mounting bracket that would work with the popular commercial tracks. While I am at it, offering a case to store the timer, cabling and start switch would round things out. One negative that I see with the timer is the 18 month warranty. Many other timer manufacturers offer at least a 3 year warranty. Additionally, I hope they can get their precision down closer to 0.0001 seconds, as that might be a concern for ultra competitive races. Support for Derby Timer has been added to GrandPrix Race Manager software. That is available as an update to Version 14 users. Version 13 and below users can use Derby Timer's interface instructions for the custom timer setup screen. 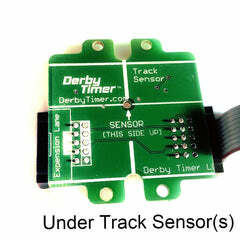 Support was also added to the new Derby Car Tracker software. That is available as an update as well. 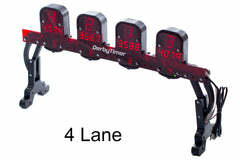 For full disclosure, Derby Timer provided a single lane and a 4 lane timer for me to evaluate. Also, for those that do not know me, I am the author of GrandPrix Race Manager and Derby Car Tracker software. Wow, that is pretty nice looking, has a bit of a different look and vibe then some of the other timers out there. Nice looking unit. Do you know the pricing for these? I had sent an email through their website a month ago and never got a response. Sorry for the delay. 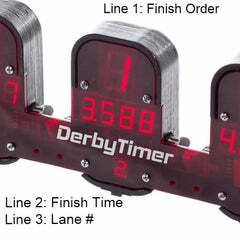 A 4 lane Derby Timer (v1) was $299 for the 2014-2015 season, but is no longer being produced. Per notices on the website, an updated timer will be released in the fall for the 2015-2016 season. Pricing for the new model is not yet determined, as the design (and related build cost) is not yet final. Do you plan on offering the timers in 2016? Perry24 wrote: Do you plan on offering the timers in 2016? I am rather surprised and disappointed that they haven't responded to your question. The last I heard was that they had a new design in the works, something easier for them to manufacture, but it was taking them longer than expected. That is unfortunate, as they have already missed the busiest month of the season.